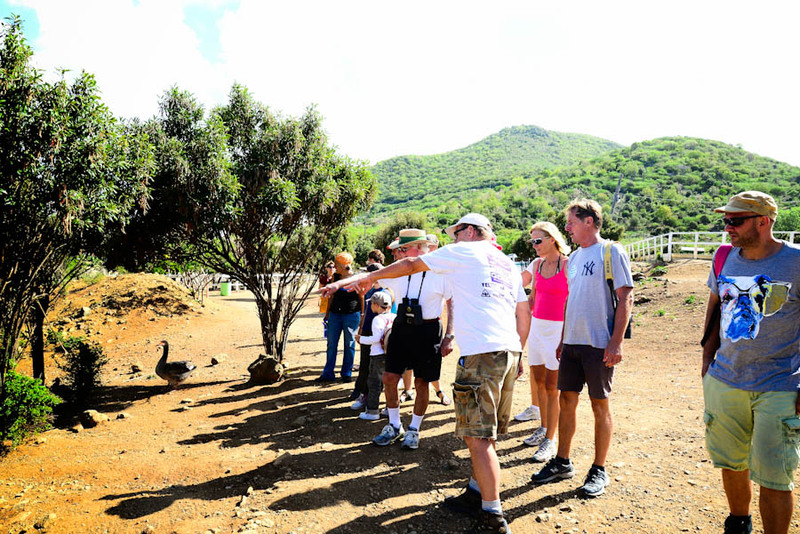 St. Martin’s endemic animals are the species that live only here and nowhere else in the world. They are survivors. 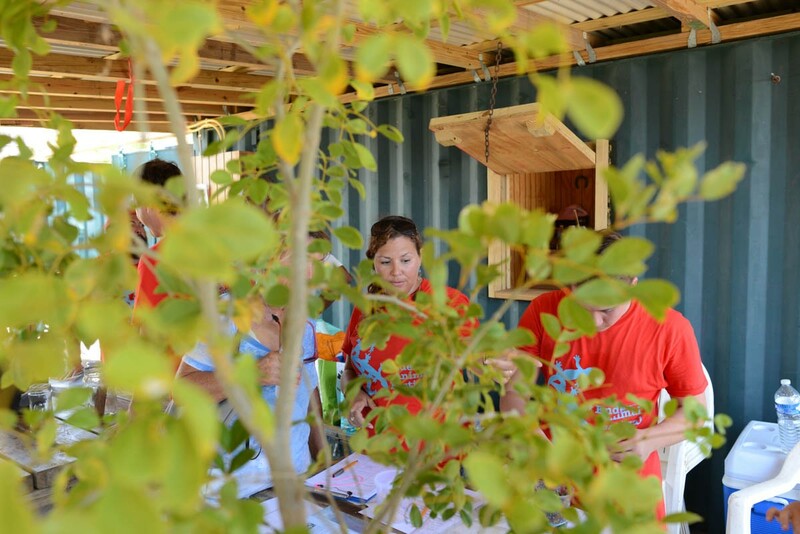 They adapted to this island and made St. Martin their home. 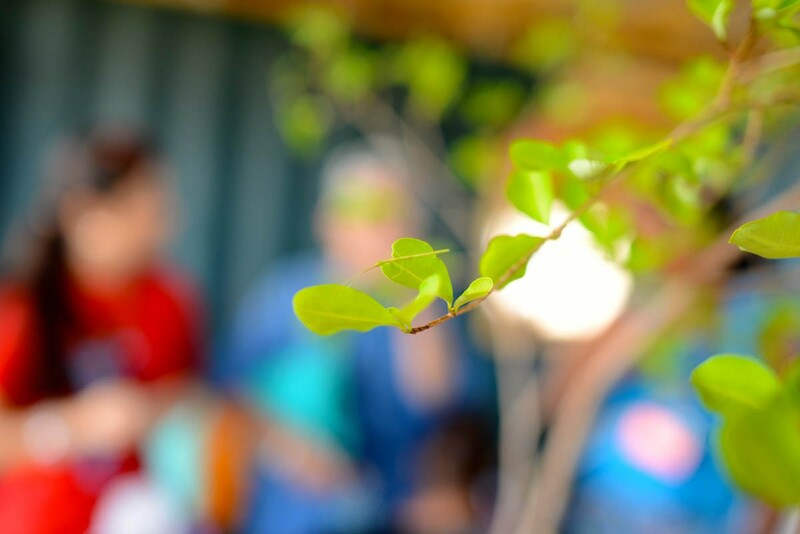 They learned to live through dry seasons, droughts and terrible storms. They stayed alive even when their habitat was changed by people and new animals like rats, mongoose and monkeys threatened them. 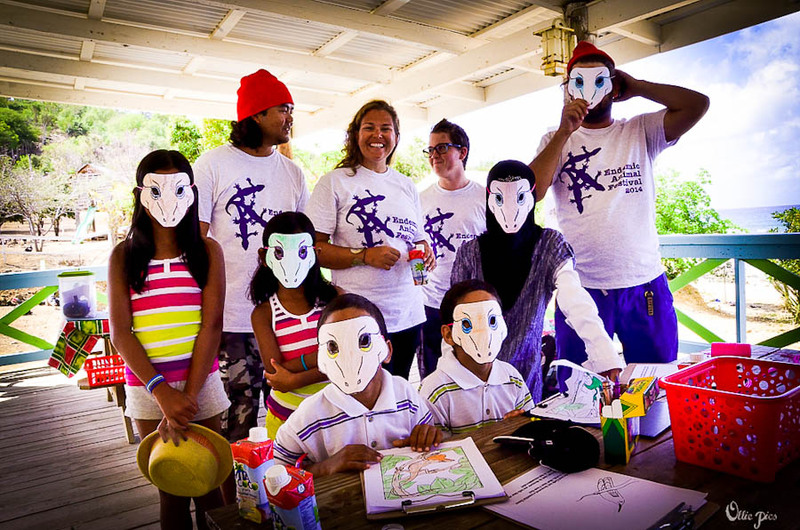 The people of St. Martin are survivors, too. 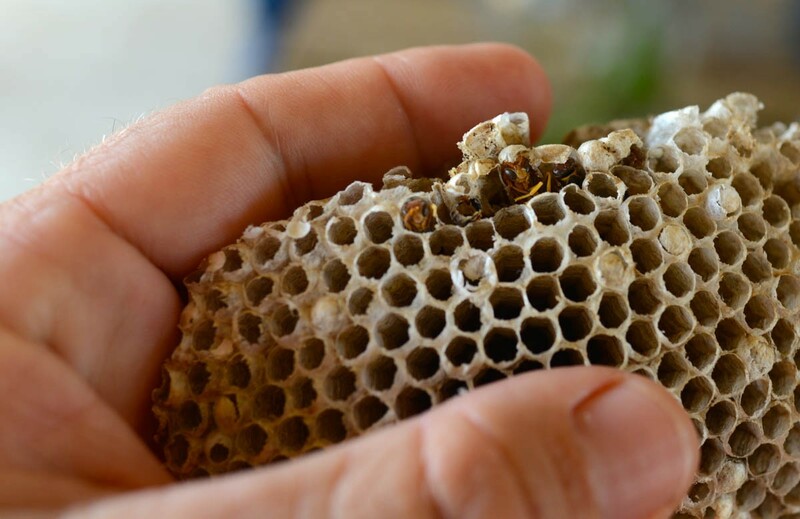 They often depended on their own ability to raise or catch their food and build the things they needed. Doing this, they developed their own culture and knowledge. Today, we are all survivors of new threats—pollution, rising seas, more severe hurricanes and many more. We must take action to ensure our community, our nature and our island are survivors in the future. Join and share on Facebook! Founded in 1985, Delta serves the Caribbean with superior performance diesel, gasoline and LPG meeting U.S. and European standards. 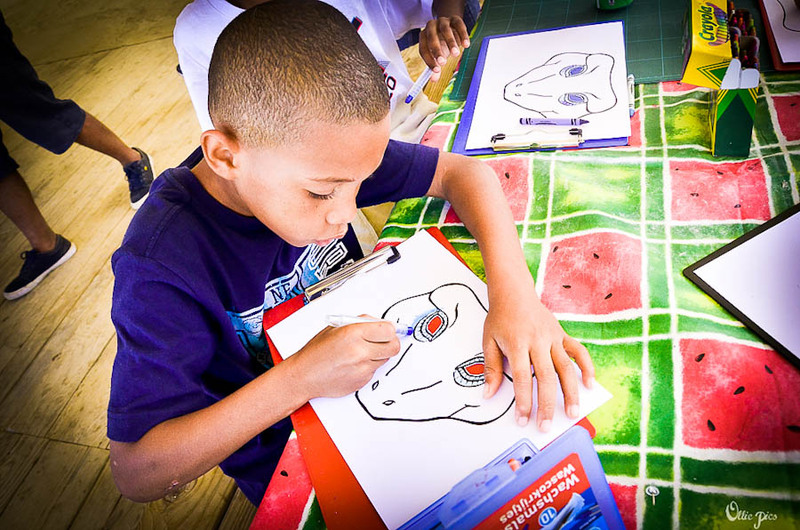 Delta is a proud and growing member of the communities from the Virgin Islands to Martinique. 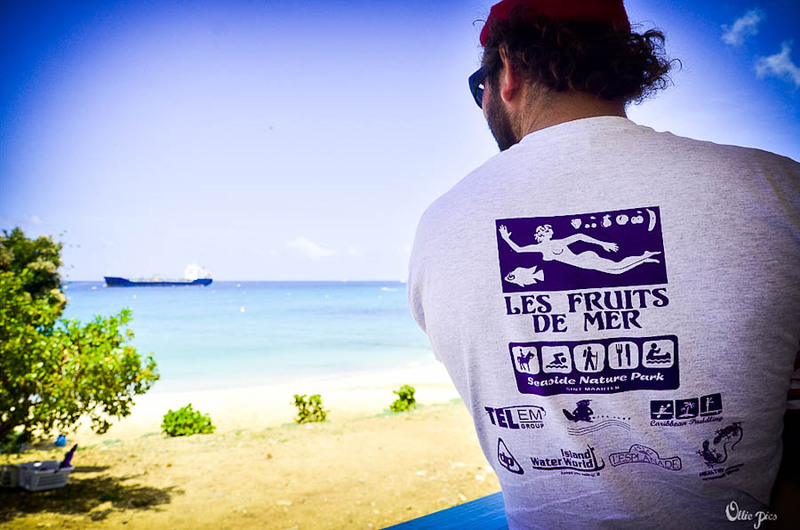 Delta Petroleum has sponsored Les Fruits de Mer events since 2013. 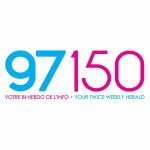 97150 is St. Martin’s most popular bi-weekly newspaper in French. 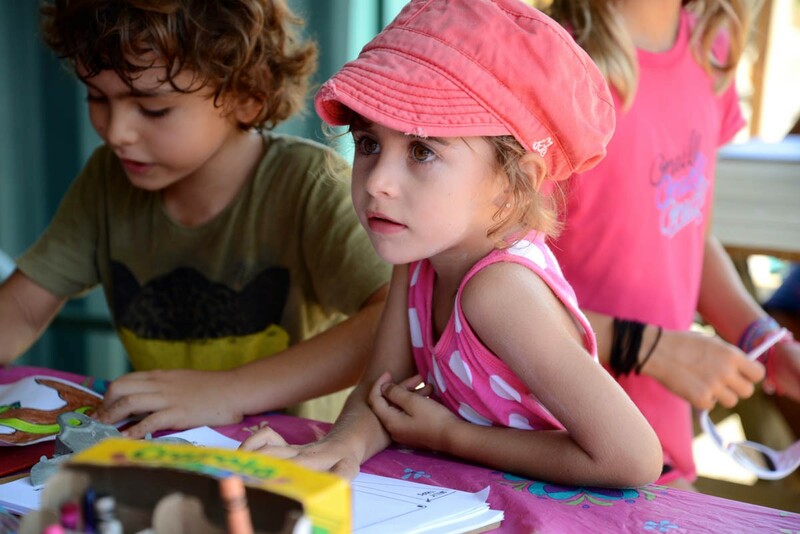 Get all the latest news, find out about upcoming events and much more! 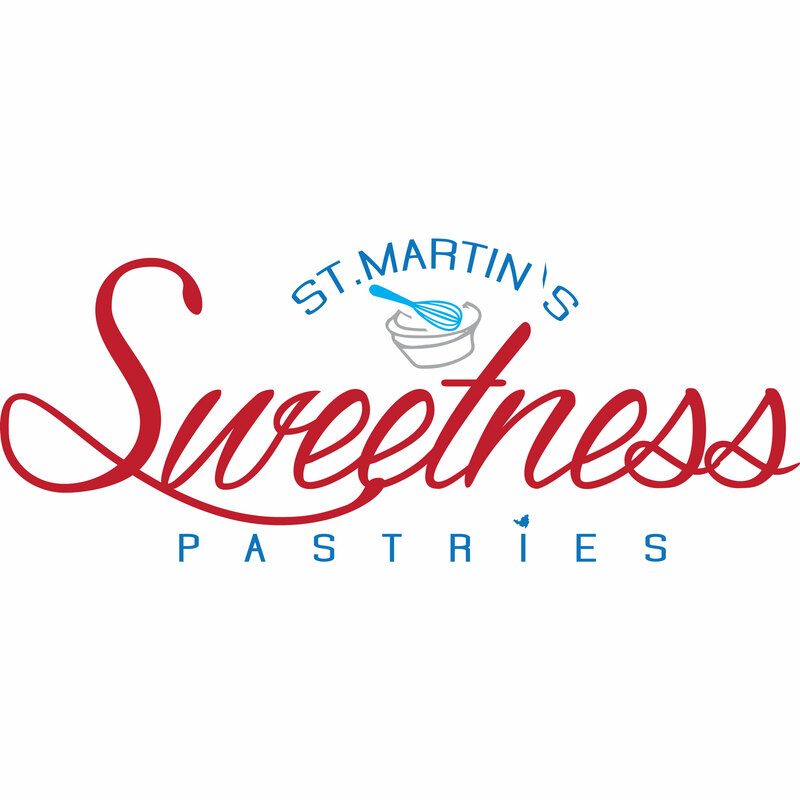 Available for free every Tuesday and Friday all over the island and online, too! 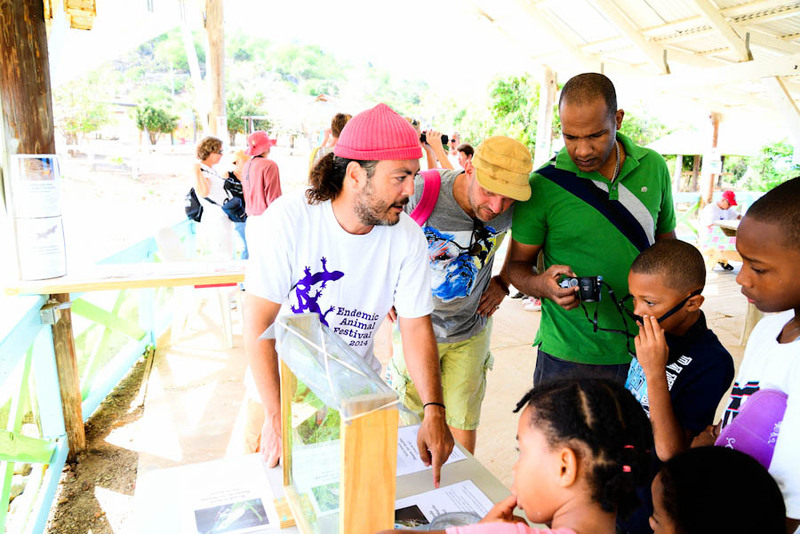 BirdsCaribbean is a vibrant international network of members and partners committed to conserving Caribbean birds and their habitats. 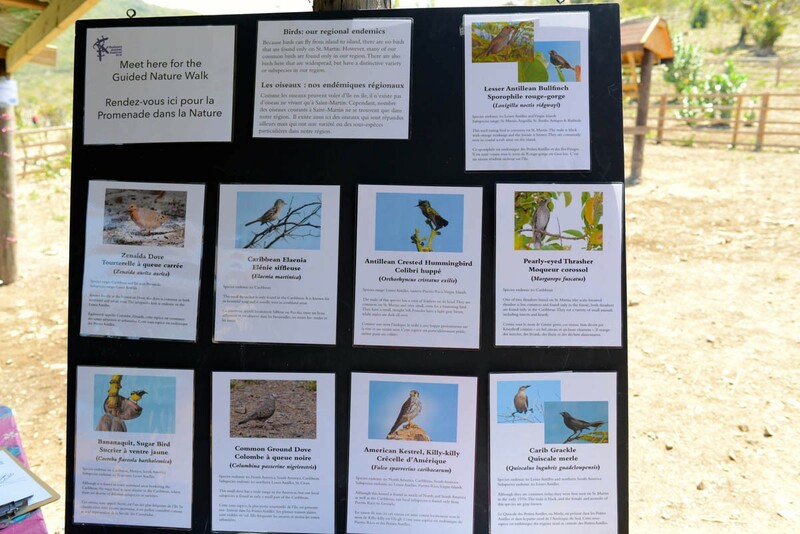 They raise awareness, promote sound science, and empower local partners to build a region where people appreciate, conserve and benefit from thriving bird populations and ecosystems. They are a non-profit (501 (c) 3) membership organization. 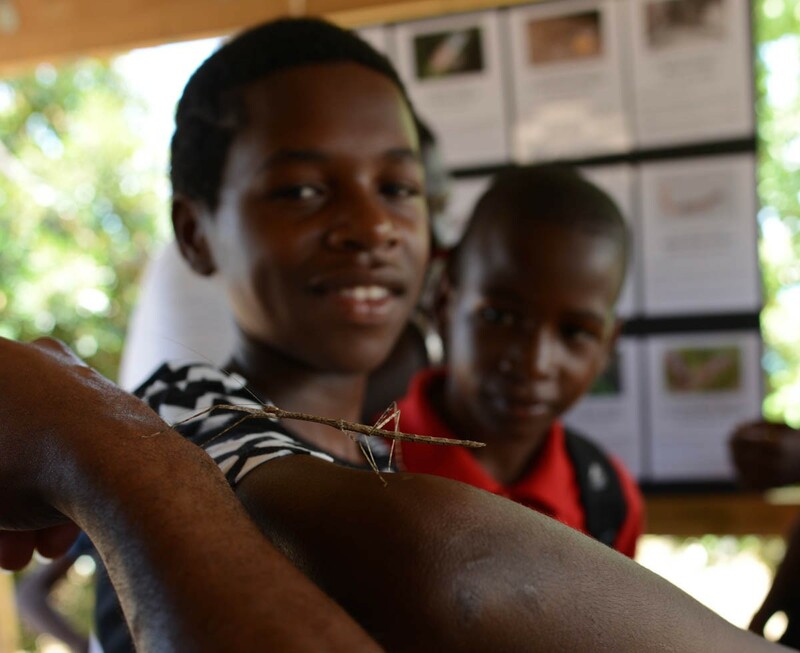 More than 100,000 people participate in their programmes each year, making BirdsCaribbean the most broad-based conservation organization in the region. If you need the latest in tech and electronics, head to Buzz. You’ll find computers, phones, entertainment, cameras and more. 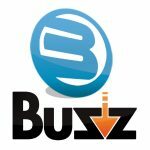 They are an official Apple reseller and they have two convenient locations: Buzz in Hope Estate and the Ti Buzz boutique in Howell Center. 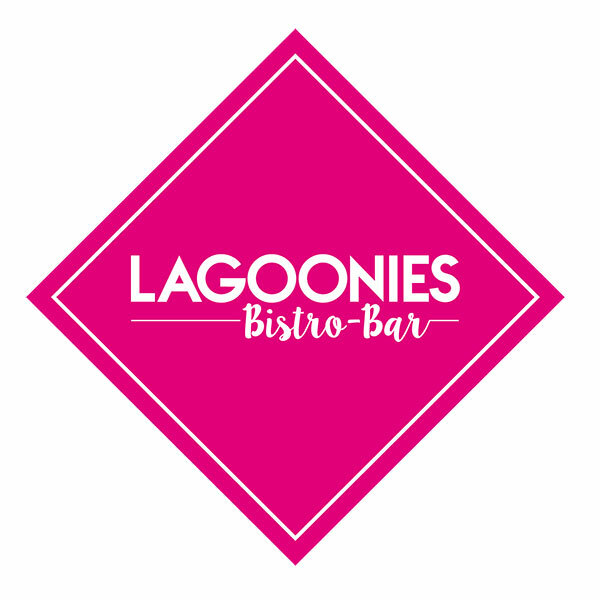 Lagoonies Bistro and Bar serves food that is crazy good for breakfast, lunch and dinner and hosts some of the hottest live music on the island several nights a week. Located at Lagoon Marina in Cole Bay, they are easily accessible by land or sea. Conveniently located in Cay Hill with easy access to both Philipsburg and Simpson Bay, L’Esperance Hotel features 22 spacious and luxurious one and two bedroom suites appointed in tropical rattan. Features include our beautiful pool with a sun deck, air-conditioning, cable TV, direct dial telephones, in-room safes, full kitchens, private balconies, and free Wifi. 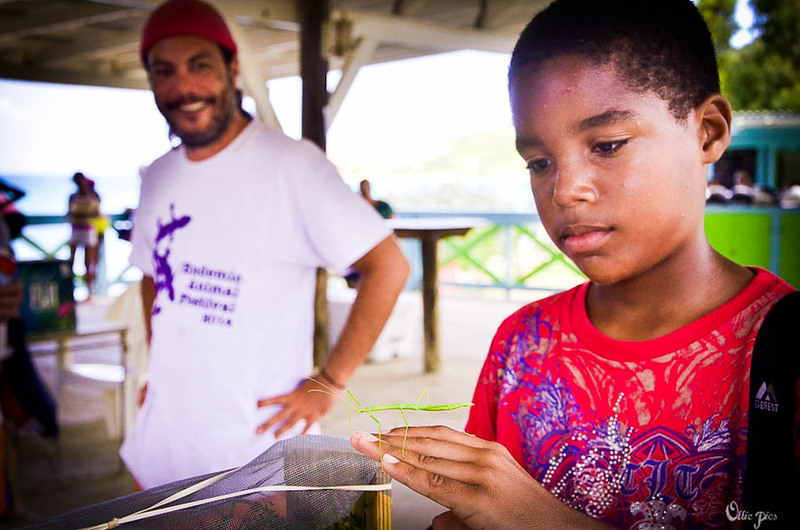 Les Fruits de Mer’s annual Endemic Animal Festival is a free public event for all ages that celebrates the unique wildlife and natural heritage of St. Martin. 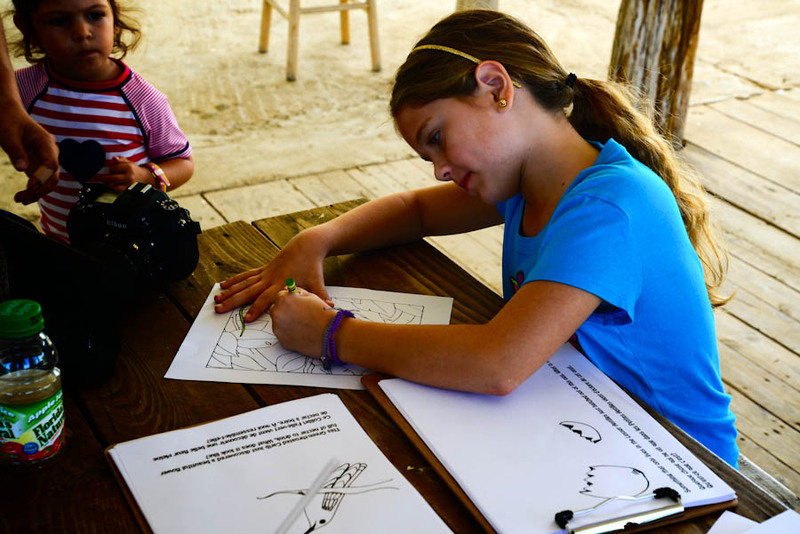 It’s a fantastic opportunity to learn about the animals that only live on this island or in our region. The 2018 event will take place at the new site of Amuseum Naturalis at The Old House in French Quarter. We will be relaunching the museum itself later in 2018. Our theme for 2018 is Made Here. 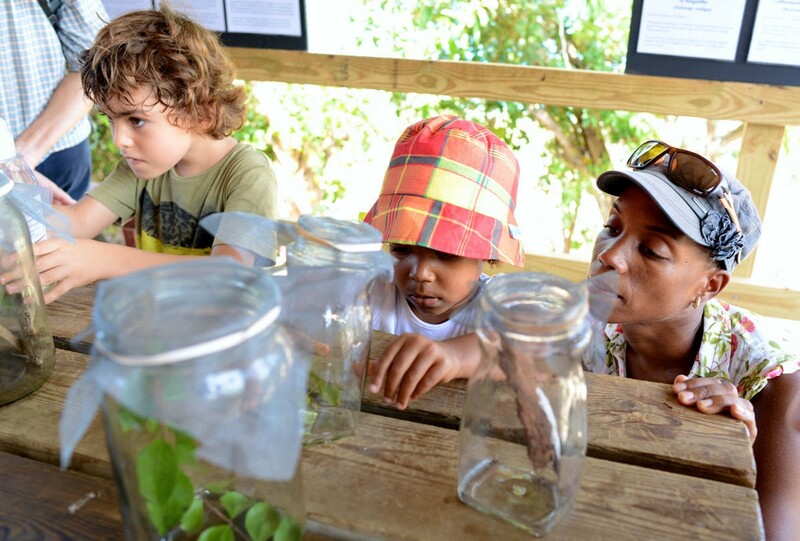 Activities will include our Endemic Animal Discovery Station, birdwatching, local wildlife-themed art activities, and the launch of Plantilles, our native plant and community garden projects on the historic Old House property. 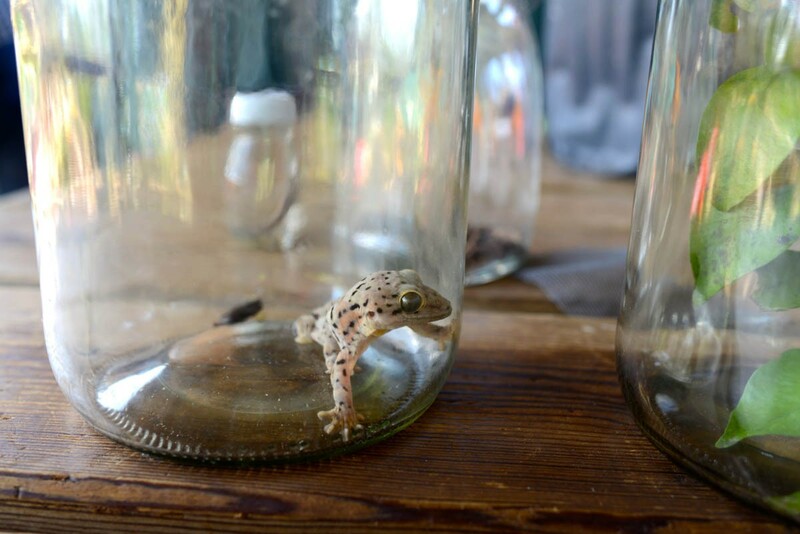 The event will also host several local experts exploring the Made Here theme as it relates to local wildlife, heritage and culture. The 2018 festival will be held Sunday, May 20th from 9am to noon, and is made possible by support from our sponsors: BirdsCaribbean, Delta Petroleum, Happy Wine, Lagoonies Bistro and Bar, Location De Bennes Diligence Express and Tri-Sport. Join and share the festival on Facebook! Happy Wine Enjoy great wines and great value with Happy Wine. Happy Wine distributes to both restaurants and individuals, so you can enjoy the expertise that top restaurants rely on when buying wine for your own home. All of the wines distributed by Happy Wine are certified organic! 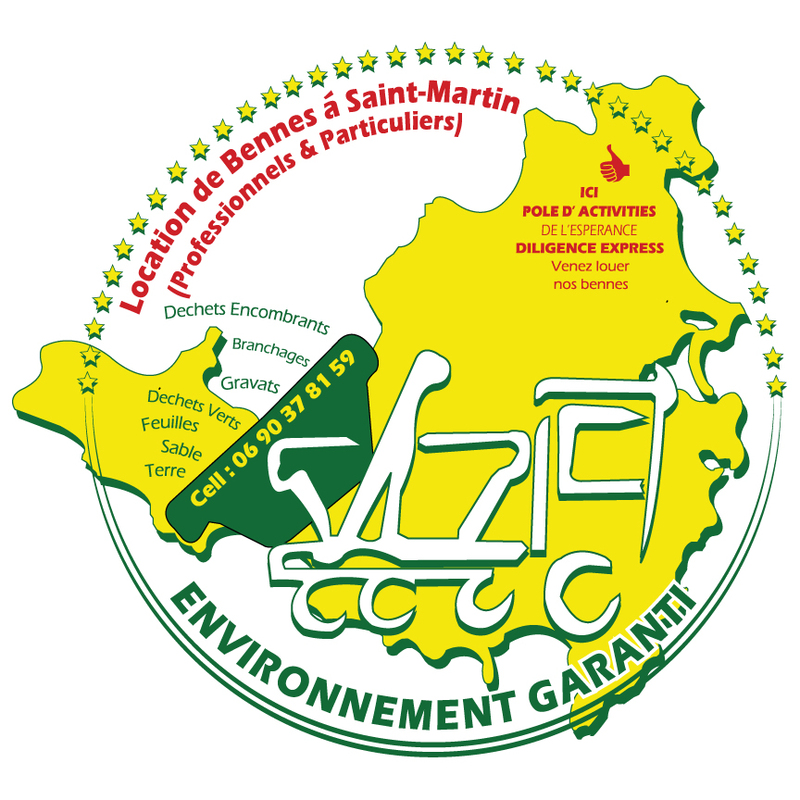 Location de Bennes Do you need reliable delivery and pickup of dumpsters? 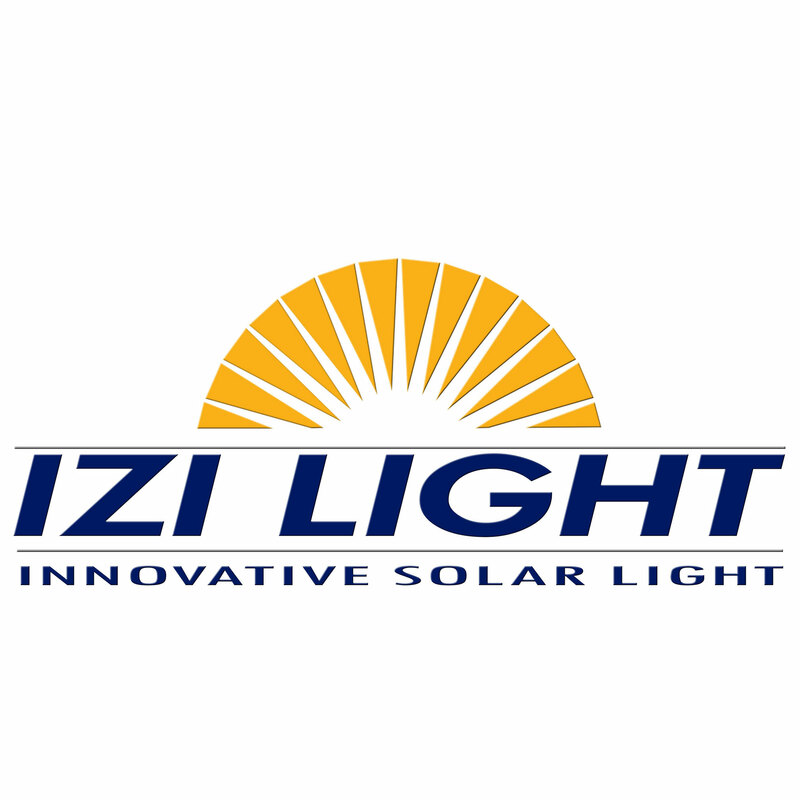 Call Eric at 0690-37-81-59! He will deliver to your location and pick up when you are done filling your container. Location de Bennes is friendly and dependable and their containers open for easy loading. Thank you to all our sponsors and volunteers for making the 2017 festival a great success! Check out the blog for photos from the event: 1, 2, 3. 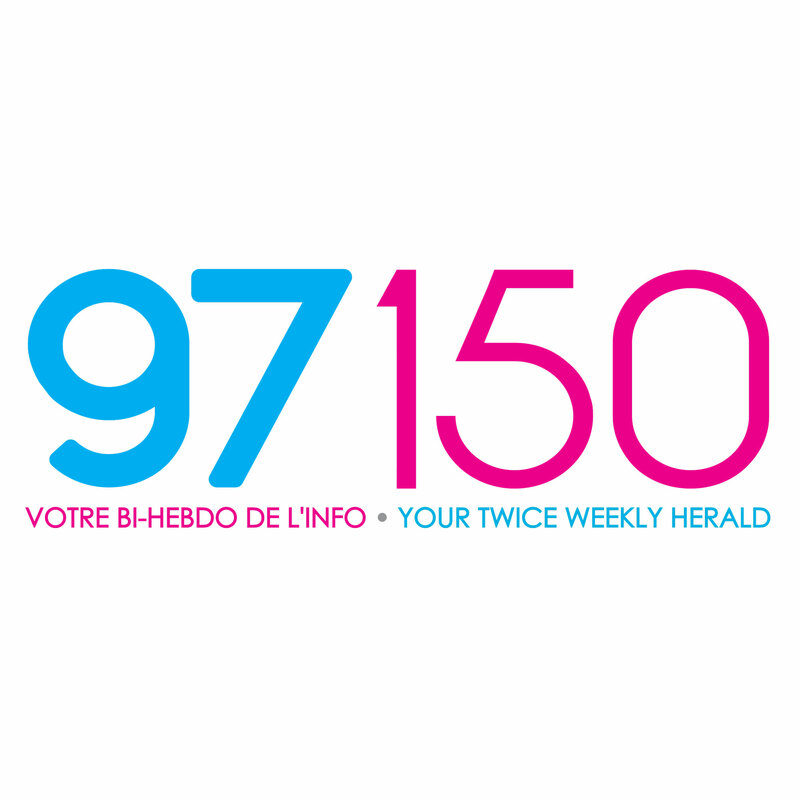 You can also check out a summary of local press about the event. 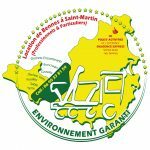 Les Fruits de Mer’s annual Endemic Animal Festival is a free public event for all ages that celebrates St. Martin’s unique wildlife and natural heritage. 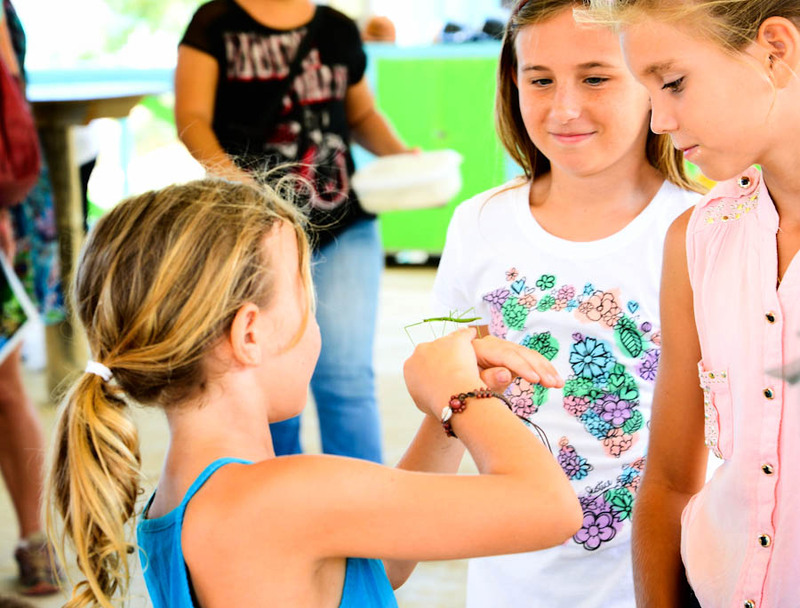 It’s a fantastic opportunity to learn about the animals that only live on this island or in our region. 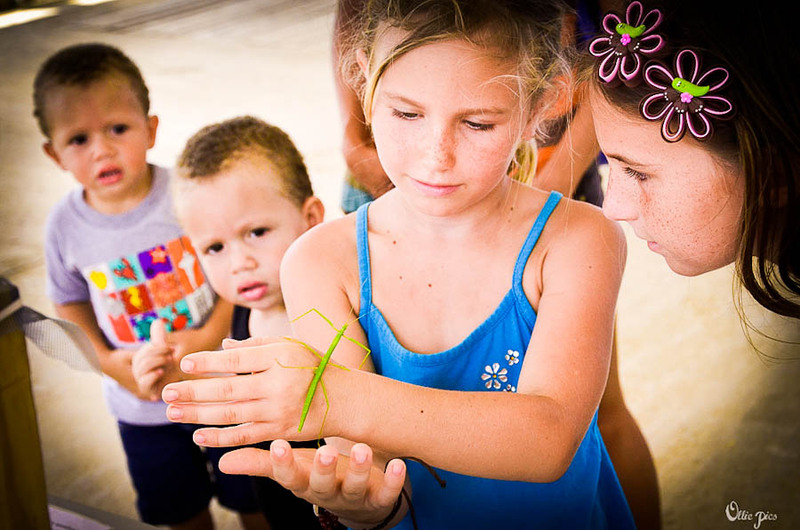 The 2017 event features an Endemic Animal Discovery Station, a Club Gaïac seedling giveaway, local wildlife-themed art activities and free access to the island’s only natural history museum. 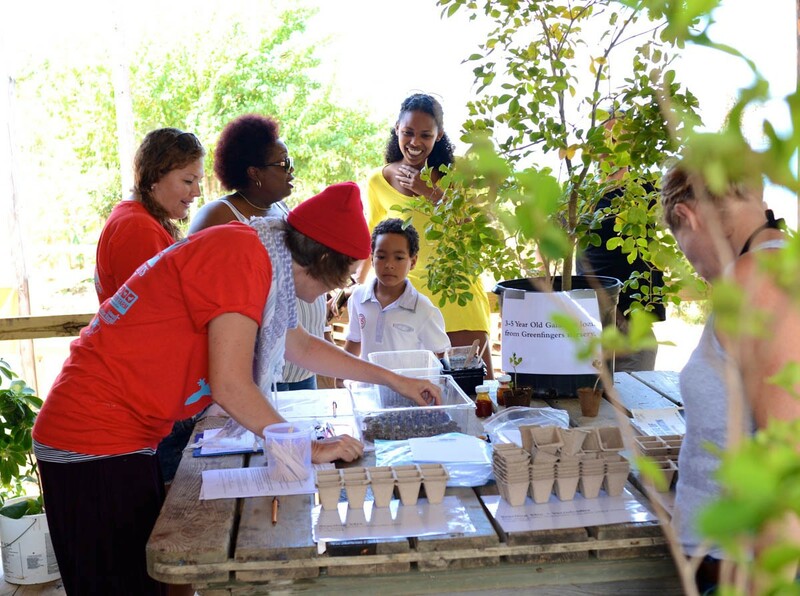 It will take place at Amuseum Naturalis, 96 Grand Case Boulevard in Grand Case on Sunday, April 23rd from 9am-3pm. The festival is made possible by our sponsors: BirdsCaribbean, Tri-Sport, Caribbean Paddling, Delta Petroleum, Hotel L’Esplanade, IGY Marinas, Lagoonies Bistro & Bar, L’Esperance Hotel, Rockland Estate, Sonesta Great Bay Beach Resort, Casino & Spa, Sonesta Maho Beach Resort & Casino and The Scuba Shop. For more information about Amuseum Naturalis, visit amuseumnaturalis.com. Caribbean PaddlingAs everyone on St. Martin knows, a trip to Pinel Island is the perfect way to spend the day. Renting a kayak or stand-up paddleboard from Caribbean Paddling is the perfect way to get to get there. They even have a giant paddleboard for up to six people. 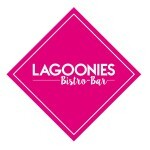 Visit their website to see everything they have to offer. 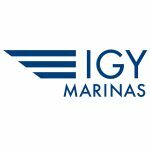 IGY operates the award-winning marinas Isle de Sol and Simpson Bay Marina. 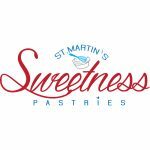 Their marinas are ideally located in Simpson Bay, offering a full range of services and easy access to all the island has to offer. 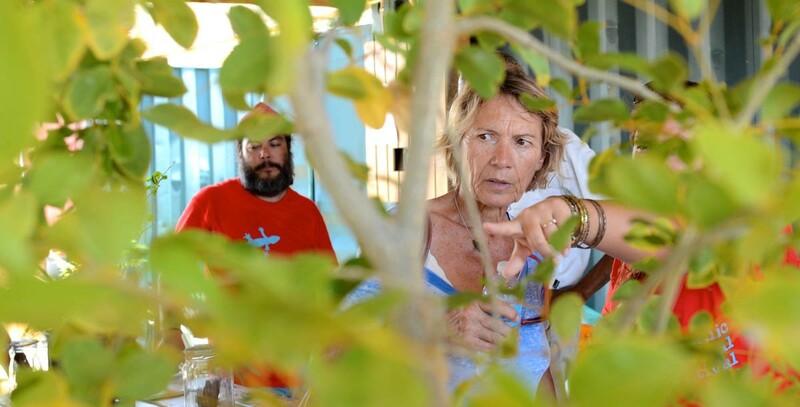 The Yacht Club at Isle de Sol was awarded the prestigious Blue Flag eco label in October of 2011, making St. Maarten the first country in the Dutch Caribbean to have a Blue Flag marina. 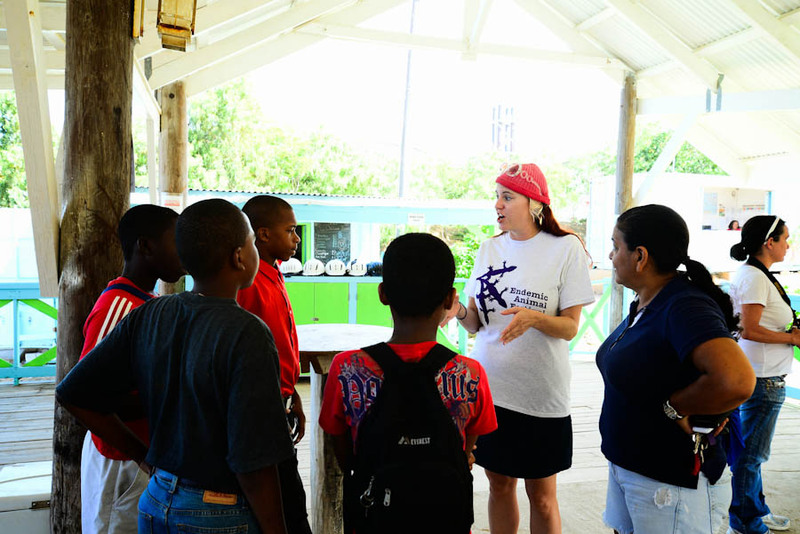 Founded in 1993, The Scuba Shop is conveniently located in Simpson Bay. 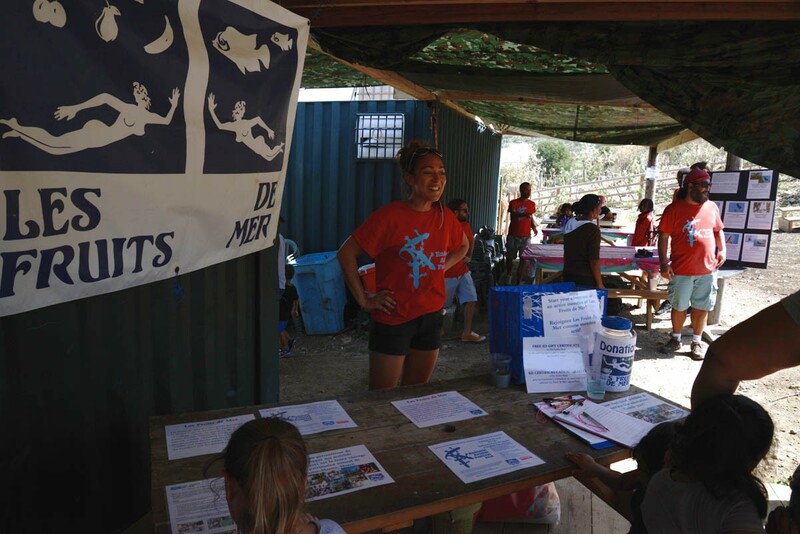 They are the largest dive store in the Windward and Leeward islands and an long-time supporter of Les Fruits de Mer and the Endemic Animal Festival. Swing by for scuba or snorkeling gear, or to pick up their free snorkeling guide. Sonesta Resorts St. Maarten features three stunning oceanfront limitless all-inclusive properties including the family-friendly Sonesta Maho Beach Resort, Casino & Spa, the adults-only Sonesta Great Bay Beach Resort, Casino & Spa and the newest addition, the luxury adults-only Sonesta Ocean Point Resort. Each property boasts several restaurants and bars, multiple pools, extensive wedding, events and meeting facilities, casino and a signature Serenity Spa offering treatments to pamper guests. All inclusive Day passes are available at $89 for Sonesta Maho or Great Bay Beach Resort, as well as discounted local resident rates for overnight stays. 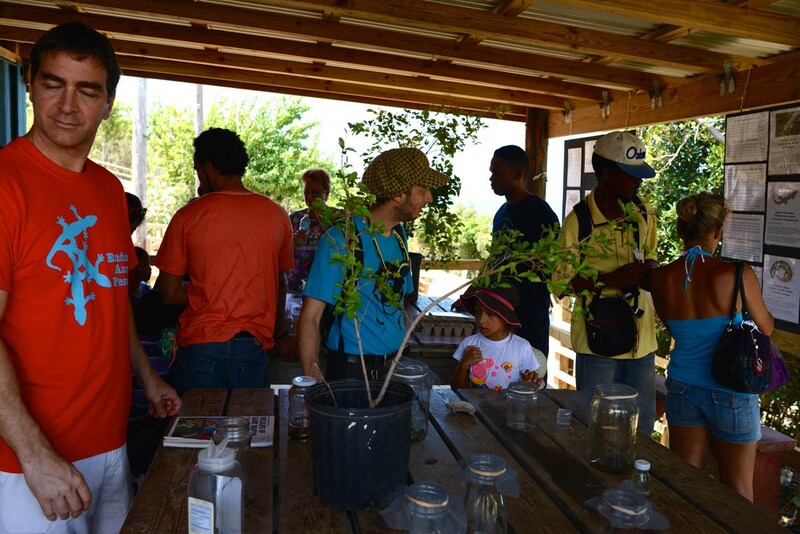 Rockland Estate is the latest attraction from Rain Forest Adventures. Set to open this summer, the adventure park will feature the world’s steepest zip line, The Flying Dutchman, the Pirate Sky Ride and a variety of other activities. 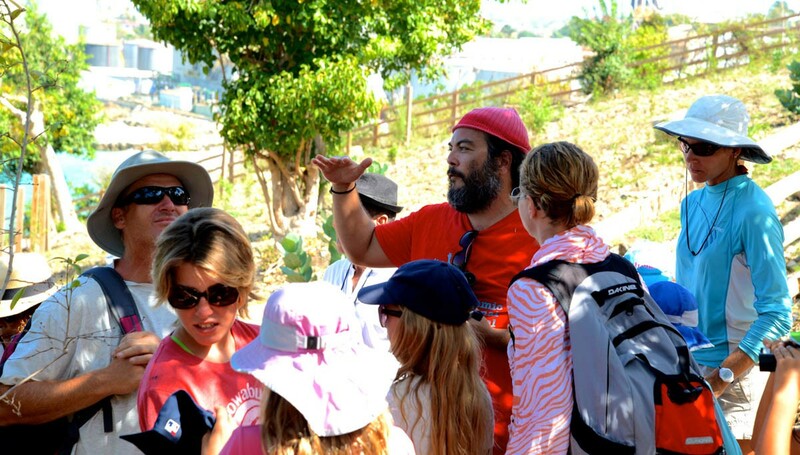 The park will also feature a walk-through museum in the estate’s restored plantation house. 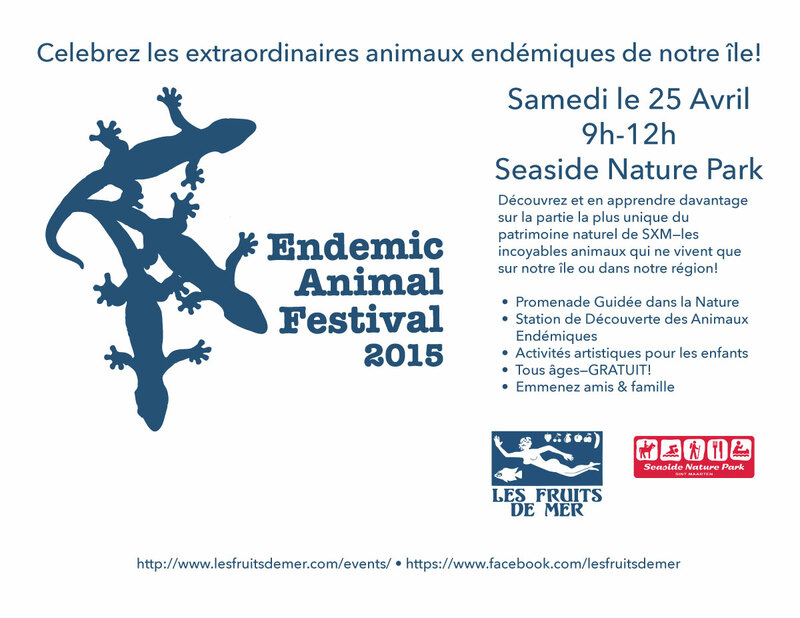 Les Fruits de Mer’s annual Endemic Animal Festival is a free public event for all ages that celebrates St. Martin/St. 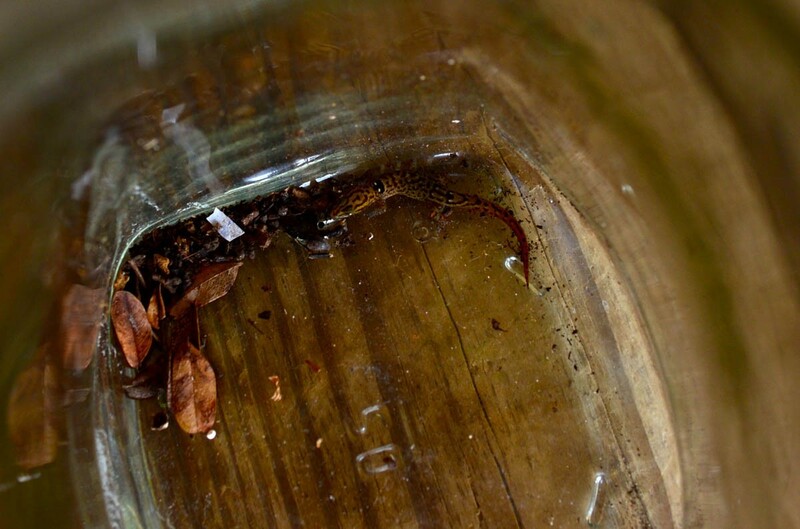 Maarten’s unique wildlife and natural heritage. 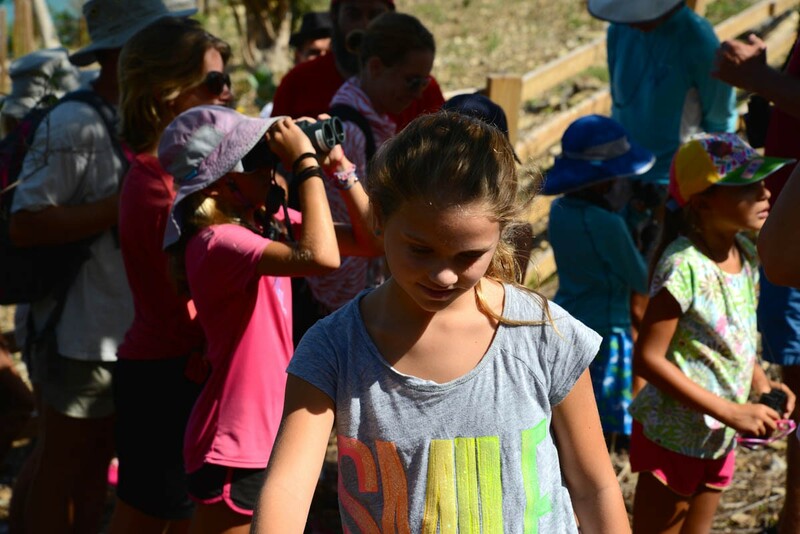 It’s a fantastic opportunity to learn about the animals that only live on this island or in our region. 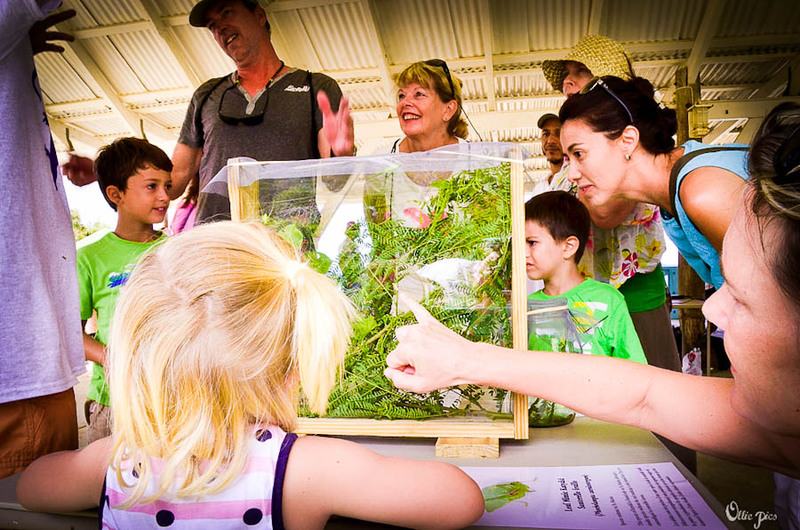 The 2016 event features an Endemic Animal Discovery Station, birdwatching station, native animal activity books, and local wildlife-themed art activities for children. 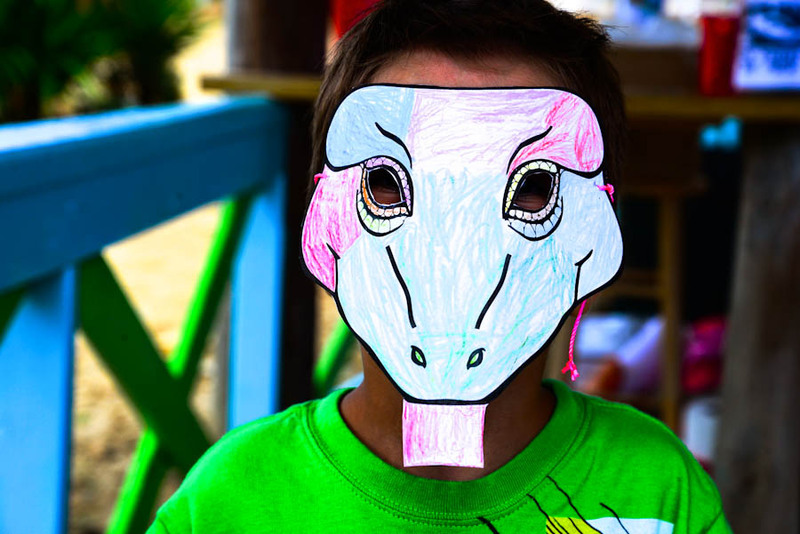 It will take place at the St. Maarten Zoo on Arch Road in Madame Estate on Sunday, April 24th from 9am-12pm. 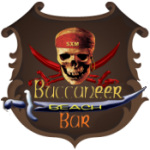 The festival is made possible by our sponsors: Buccaneer Beach Bar, Calmos Cafe, Delta Petroleum, Hotel L’Esplanade, Lagoonies Bistro and Bar, Loterie Farm and Tri-sport. Help: Contact us to be a volunteer or sponsor for the event. Share: Join and invite friends on Facebook. Download a printable event poster: English, French. 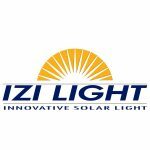 Follow: Check out the latest updates on our blog. Loterie Farm is a private nature reserve on the western slope of Pic Paradis. The 54-hectare property includes broadleaf forest as well as the remains of historical buildings dating back to the 18th century. 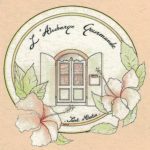 Loterie Farm aims to safeguard both the history and the environment while also sharing these unique natural surroundings with the public. 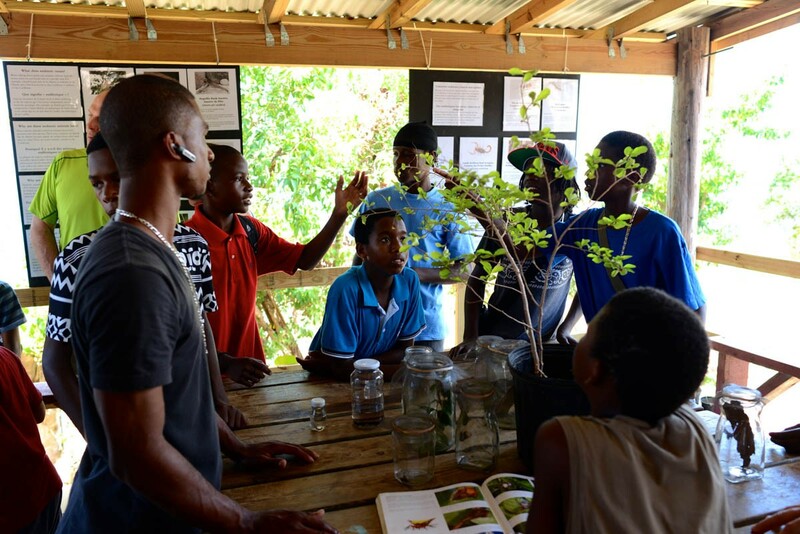 One of the most ecologically significant sites on St. Martin, Loterie Farm has hosted a great deal of biological research, including ongoing studies of birds and other animals. Loterie Farm offers hiking and zip-lining as well as a gourmet restaurant, lounge, and spring-fed swimming pool. 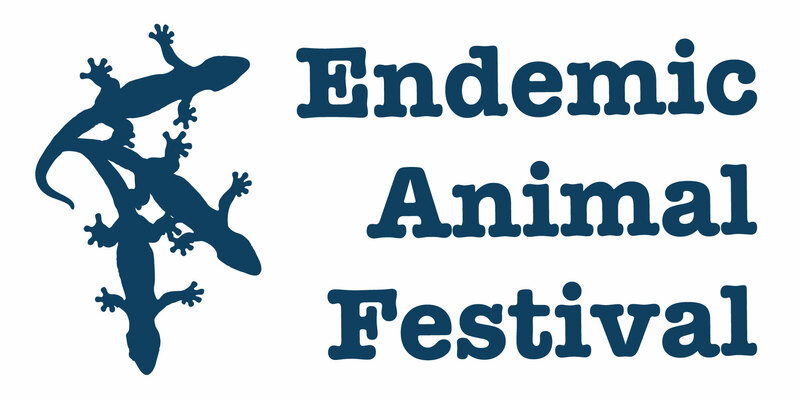 Our second annual Endemic Animal Festival will celebrate the unique animals that are found only on our island or only in our region. 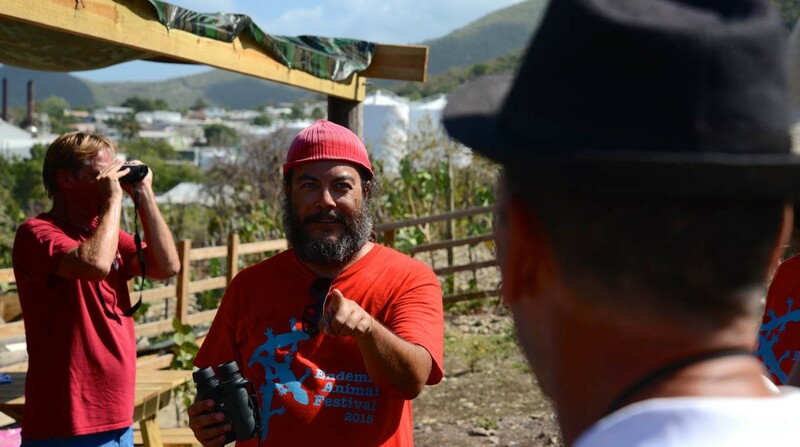 The festival will be held at the Discovery Farm and Garden at Seaside Nature Park in Cay Bay, Sint Maarten from 9am-Noon. More details coming soon. Join and share the event on Faceboook. 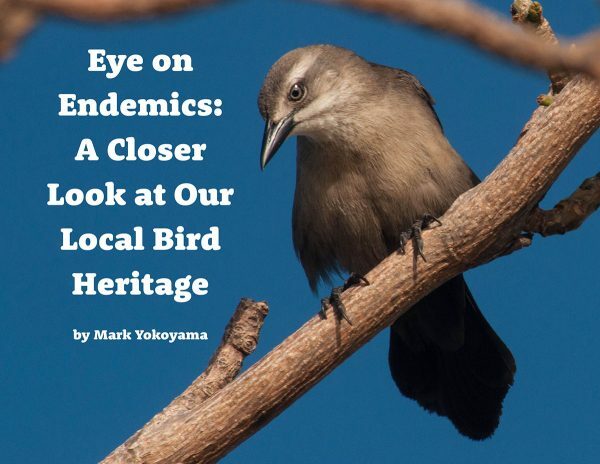 As part of our 2015 festival, we have released a free eBook—Eye on Endemics—about the regionally-endemic birds that can be found on St. Martin. You can download it from the Resources page on this site! 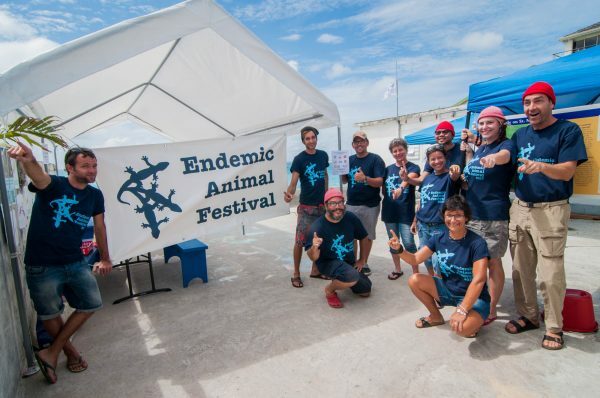 Les Fruits de Mer’s annual Endemic Animal Festival is a free event, open to tourists and residents of all ages, that promotes St. Martin/St. Maarten’s unique wildlife and natural heritage. 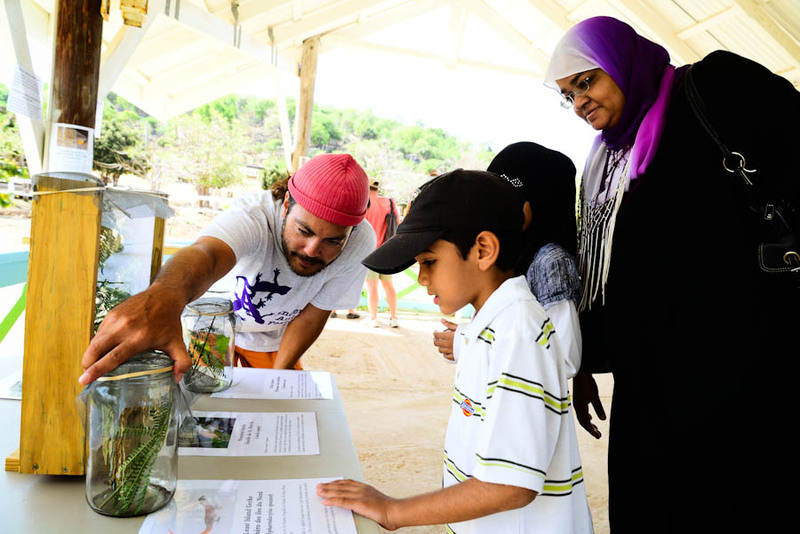 The Endemic Animal Festival is a fantastic opportunity to learn about local wildlife, important ecosystems, and history from experts–and a celebration of the fascinating natural world of this island. 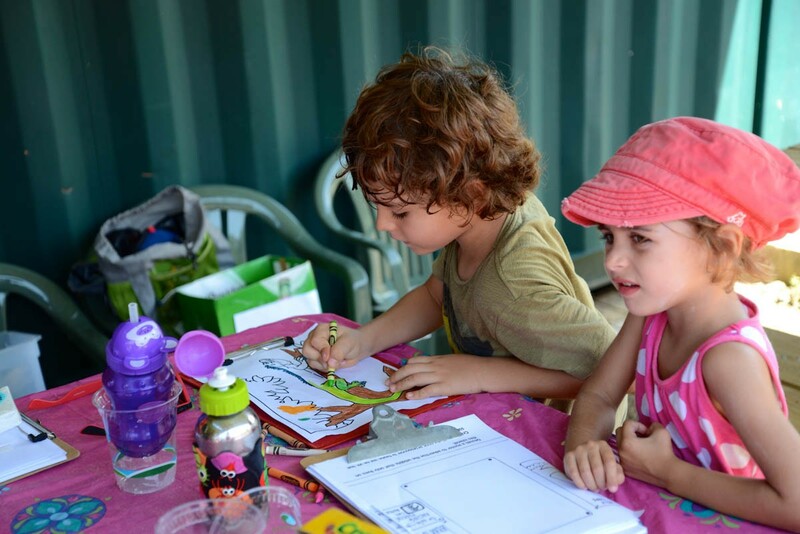 The event will feature wildlife tours guided by experts, an Endemic Animal Discovery Station, and local wildlife-themed art activities for children. 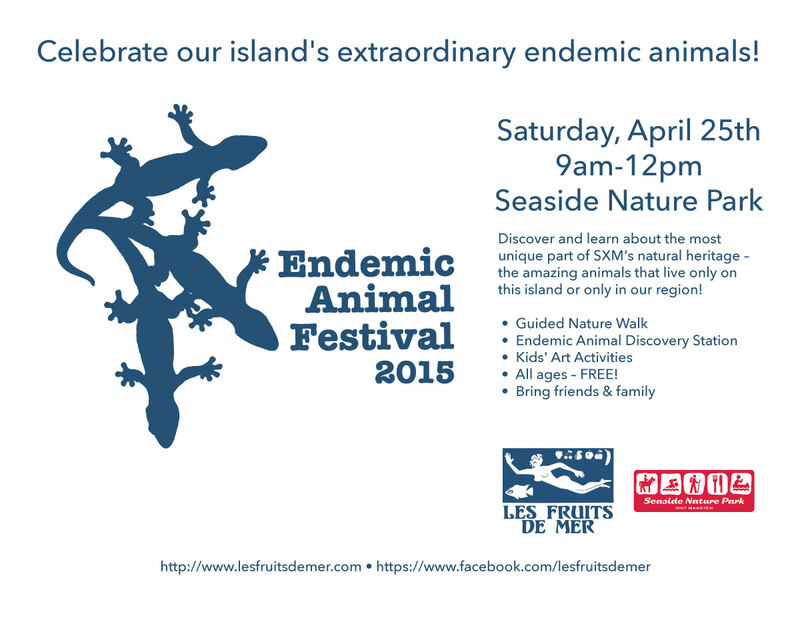 The 2015 Endemic Animal Festival will take place at Seaside Nature Park in Cay Bay on Saturday, April 25th from 9am to noon. 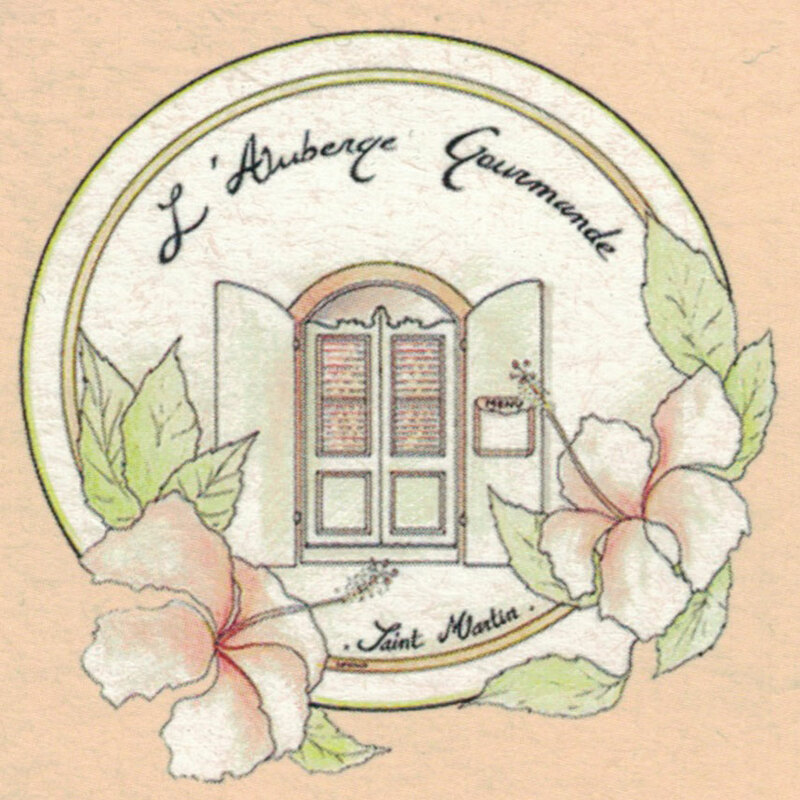 The event is brought to you by Les Fruits de Mer and Seaside Nature Park. 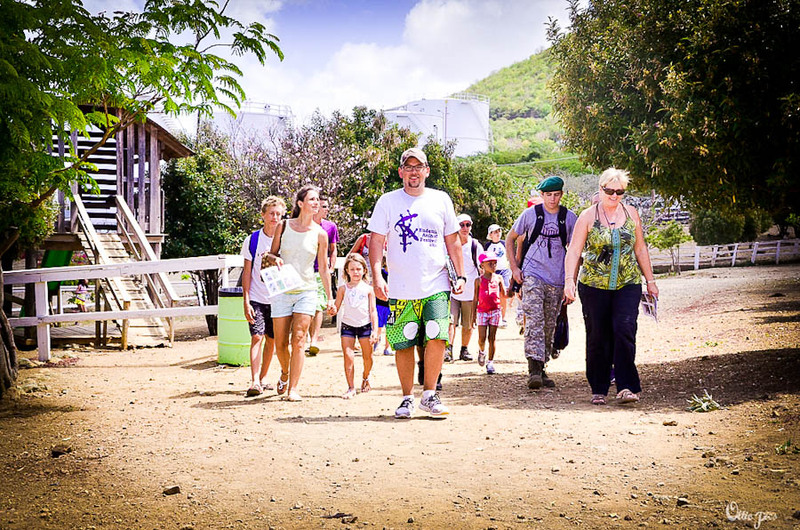 Les Fruits de Mer’s annual Endemic Animal Festival is a free event, open to tourists and residents of all ages, that promotes St. Martin/St. Maarten’s unique wildlife and natural heritage. 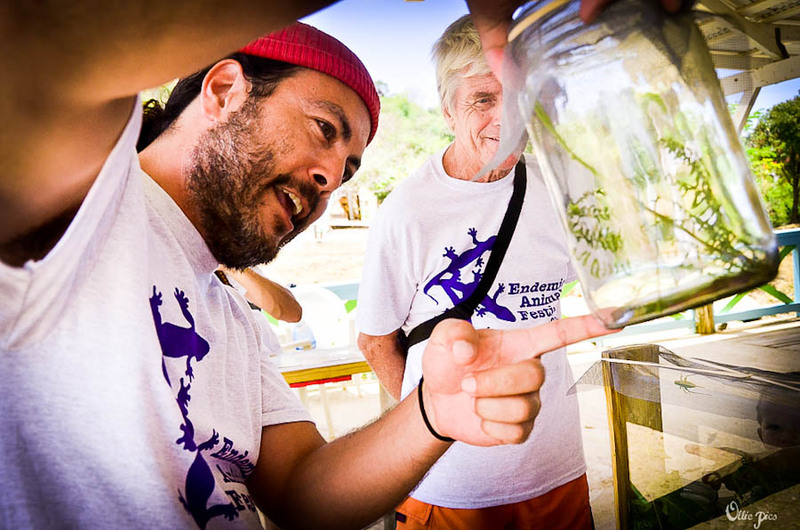 The Endemic Animal Festival is a fantastic opportunity to learn about local wildlife, important ecosystems, and history from experts–and a celebration of the fascinating natural world of this island. 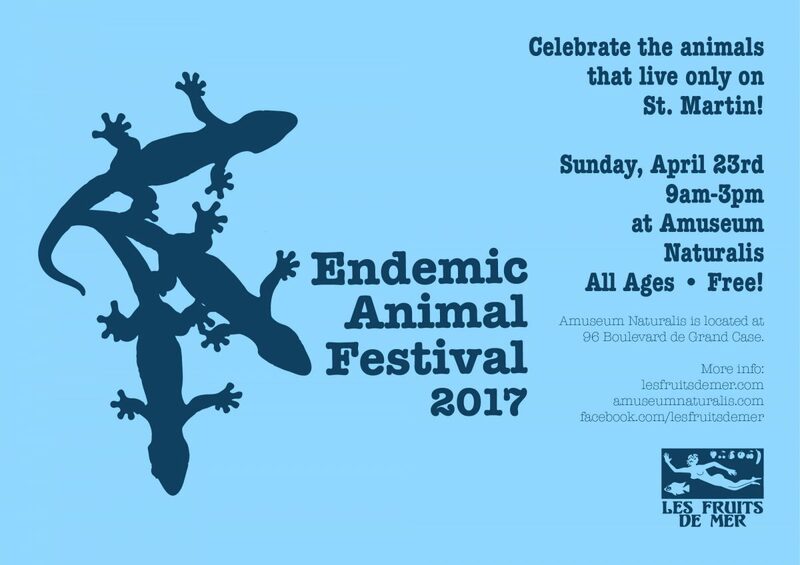 It’s the only event on the island to showcase our extraordinary local and regional endemics: the animals that live only on St. Martin/St. Maarten and those that live only in our region. 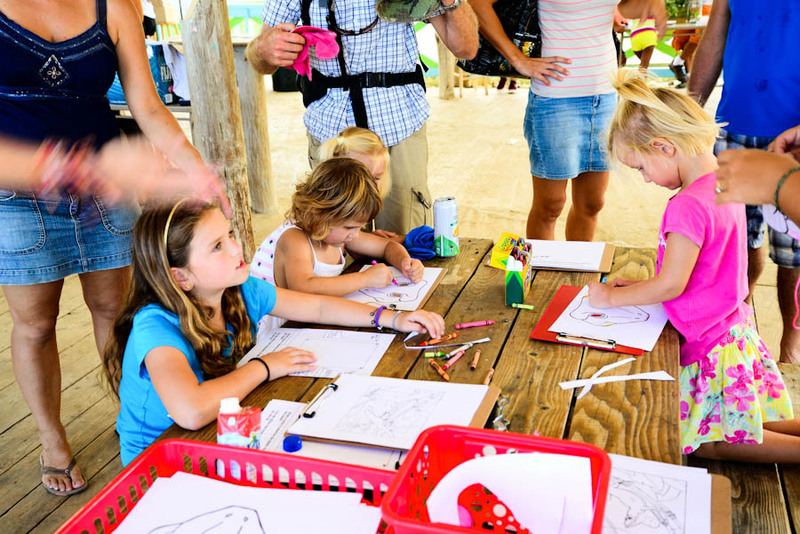 The Festival will feature wildlife tours guided by experts, an Endemic Animal Discovery Station, and local wildlife-themed art activities for children. 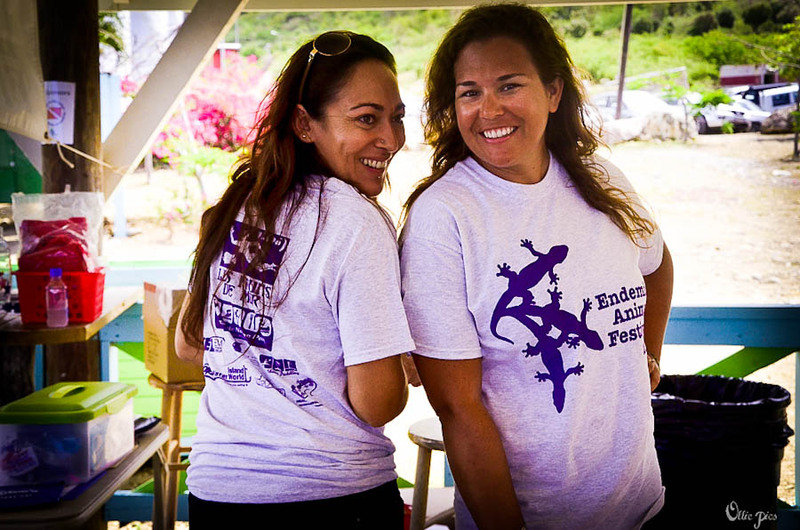 The 2014 Endemic Animal Festival will take place at Seaside Nature Park in Cay Bay on Sunday, April 27th from 9am to noon. 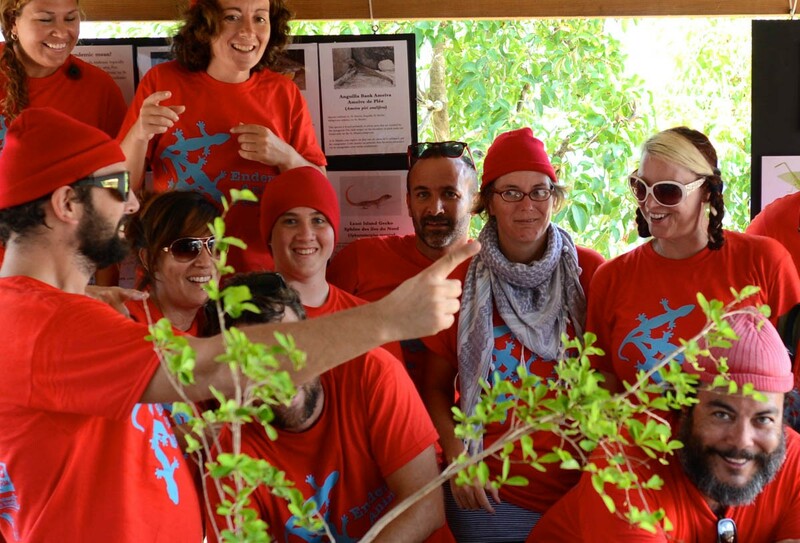 The event is brought to you by Les Fruits de Mer and Seaside Nature Park. The 2014 Endemic Animal Festival is made possible by the hard work and talent of many volunteers, the support of our partner, Seaside Nature Park, and the generous sponsorship of Hotel L’Esplanade, Delta Petroleum, Island Water World, Aquatec Shop, Healthy Iguana, TelEm Group, Caribbean Paddling and Aqua Mania Adventures, with in-kind contributions from International Liquor and Tobacco Trading and The Scuba Shop. 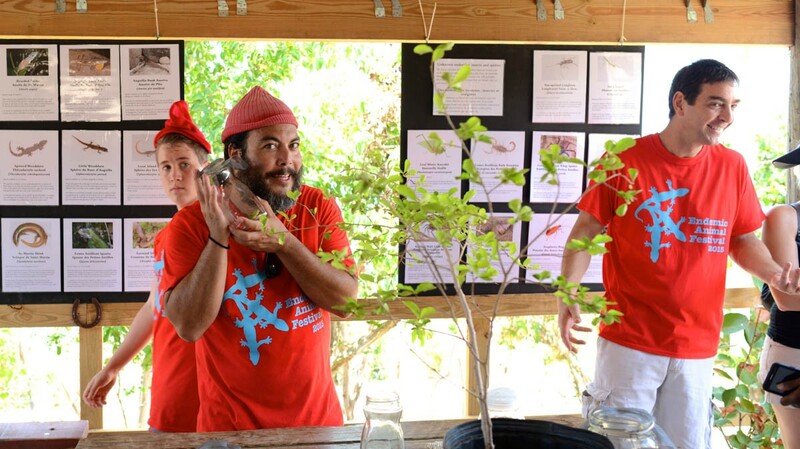 The Endemic Animal Festival is a proud participant in BirdsCaribbean’s Caribbean Endemic Bird Festival, which includes events throughout the Caribbean. 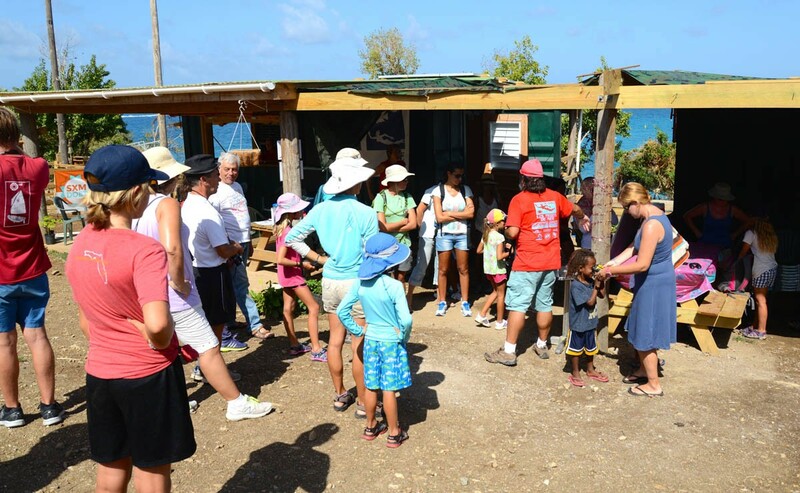 Seaside Nature Park is located on Cay Bay Road, accessible from Welfare Road in Simpson Bay near the Daily Extra Supermarket. 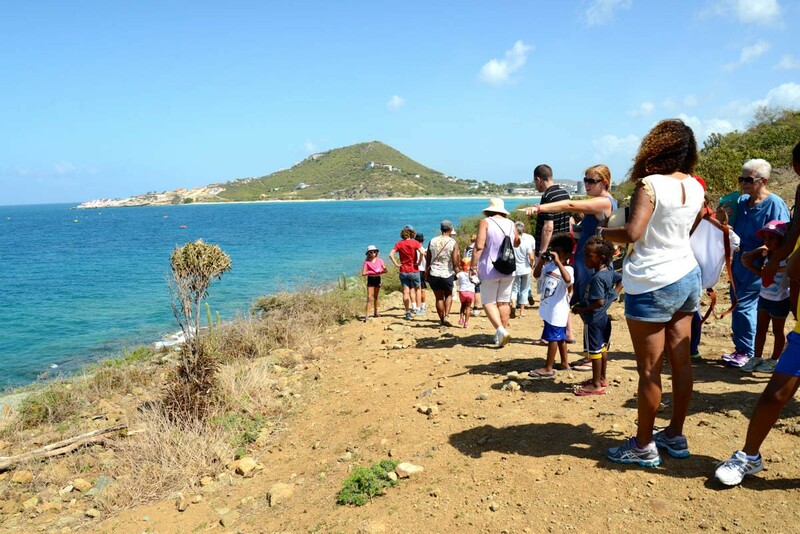 It is not accessible via Indigo Bay (Philipsburg side) because that road is not completed yet.